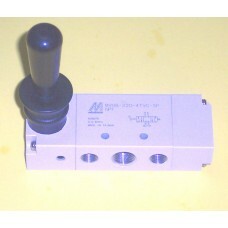 This Mindman lever valve is used to control an actuator or air motor. When lever is in the center position, the downstream pressure is blocked and the actuator stops. When lever is pulled, actuator extends. When lever is pushed, actuator retracts. When lever is released, actuator stops and lever returns to center position.